Reissue of McKillip’s 1974 fantasy tale of lost innocence; widely praised, sometimes extravagantly so, it won the 1975 World Fantasy Award. 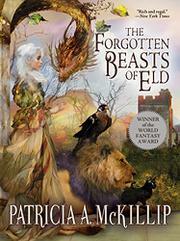 White-haired, black-eyed wizard Sybel lives alone on Eld Mountain with a collection of magical, sentient beasts—the Boar Cyrin, the Lyon Gules, the Falcon Ter, and so on—with whom she can converse telepathically. She and her forebears magically summoned the creatures, though her heart's desire to call the great white bird Liralen remains unfulfilled. Her bubble bursts when Coren of Sirle arrives claiming vague kinship and bearing a newborn baby, the son of his slain brother. Coren’s family is locked in an existential struggle with Drede, King of Eldwold, for control of the kingdom to which baby Tamlorn is heir. Reluctantly she accepts charge of the child and begins to experience the emotions she hitherto has never needed. Both Drede and Coren, it turns out, covet her beauty and her power, but Sybel refuses to take sides. Years pass. Tam, it emerges, is actually Drede’s son, so she returns him to the king. But then Drede makes a fatal mistake, leaving Sybel burning for a revenge that threatens to subvert her capacity for love. All this echoes many fantasy ideas without borrowing overmuch from any one, and it never turns derivative. The narrative is perfectly articulated, with a timeless quality accentuated by McKillip’s trademark crystal-filigree prose and undercurrents of subtle humor. On this level, then, it totally succeeds. But does it withstand closer inspection, as a great fantasy must? Well, Drede and Coren, while sympathetic and appealing (when they’re not being perverse or unpredictable), are two-dimensional—the animals have more personality. More crucially, Sybel remains incapable of introspection, unable to grasp that what she does to others is no different than what others do, or attempt to do, to her. The magic, too, is troublesome: it breeds true despite a human admixture in every generation and comes without agency, effort, learning, or downside. Like much of McKillip’s work: gorgeous, evocative, and fragile.